KUALA LUMPUR, Malaysia — Royal Dutch Shell Plc and its four partners have agreed to invest in a multibillion-dollar liquefied natural gas project in Kitimat, B.C. — the largest new one of its kind in years that would carve out the fastest route to Asia for North American gas. LNG Canada — comprised of Shell, Malaysia’s Petroliam Nasional Bhd, Mitsubishi Corp., PetroChina Co. and Korea Gas Corp. — is set to announce a final investment decision on the $40 billion (US$31 billion) project as early as Monday, said people with direct knowledge of the plans, who asked not to be identified because the matter isn’t public. The exact timing still hasn’t been decided. PetroChina and Korea Gas announced approvals of their share of the investment on Friday. The others partners declined to comment. The project marks a turning point for Canada and the gas industry. Set to be the nation’s largest infrastructure project ever, LNG Canada augurs a new wave of investments for major gas export projects after a three-year hiatus forced by a global supply glut. LNG Canada will be able to send cargoes from Kitimat — a 14-hour drive north of Vancouver — to Tokyo in about eight days versus 20 days from the U.S. Gulf. It’s also a welcome boost for Prime Minister Justin Trudeau. LNG Canada promises better prices for the country, whose energy exports are sold almost exclusively to the U.S. at depressed prices for lack of a coastal facility. It also helps reaffirm Canada’s investment climate, battered by the delayed Trans Mountain oil pipeline expansion. LNG Canada proposes to eventually export as much as 26 million tons per year. The investment approval is only for an initial two LNG trains of 13 million tons per year. Yet if built, the chances that LNG Canada will double capacity in a second phase “is all but an inevitability” due to the economies of scale, National Bank of Canada analysts led by Greg Colman said in a May report. The green light marks the end of a seven-year effort, including two postponements in 2016 at the depths of the downturn. The outlook for LNG has since brightened. The market, oversupplied for the last few years, is seen flipping to a deficit as soon as 2022 absent new projects, according to Sanford C. Bernstein & Co. LNG imports will set a new record this year of 308 million metric tons per year thanks to growth from Asia, Bloomberg New Energy Finance forecast on Sept. 12. 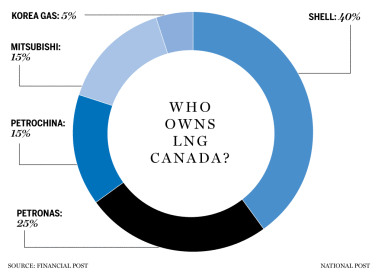 Shell holds 40 per cent of LNG Canada, with Petronas at 25 per cent, 15 per cent each for PetroChina and Mitsubishi, and Kogas with five per cent.